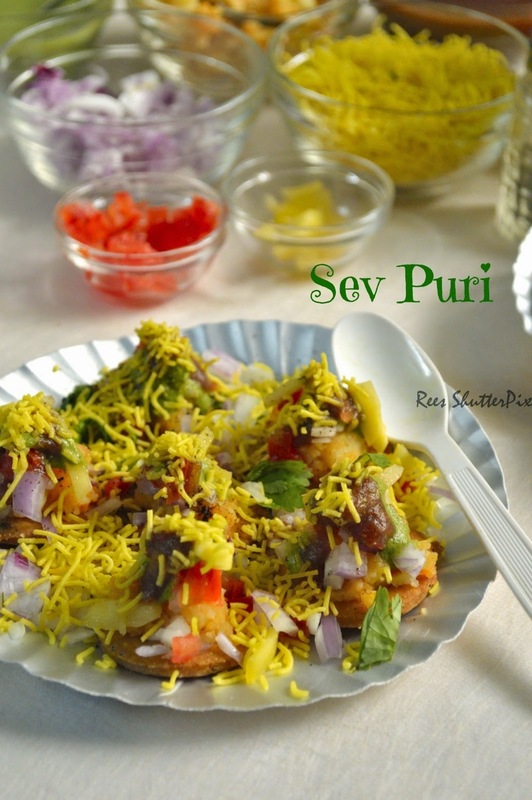 Sev Puri is a papdi topped with different veggies, chutneys and garnished with sev!!! It is one of the street food I crave for when we go to chaat shops, sometimes it's so hard to decide between all those yummies like pav bahjji, pani poori. This is one snack, which gives you crunchy treat with mixed sweet, sour and spicy flavours!!! Making these at home is so easy. All you need is a few hours of preparation in your leisure and can be just assembled to serve for kids as snack after school or guests with a cup of coffee!!! I have used store bought sev/ omam, if you want to make it. Check my recipe for baked version Sev. 1. Add ghee, ajwain and salt in a big mixing bowl. Mix it well with a spoon. Add rava and mix well. Add flour and mix well until it forms coarse texture. Slowly add water little by little to form a smooth firm dough. Add 1 tbsp of ghee at this stage and knead again. Cover the dough with a cloth for 30 minutes. Knead again for 5 minutes. Divide the dough into small balls to roll and make papdi. 2. Roll each ball into a thin layer, then prick the entire layer with a fork and then cut circles with a cookie cutter. Heat oil in a kadhai. Deep fry and drain in a tissue paper. Once cooled down, store in an airtight container. 1. Pressure cook potatoes for 3 whistles and 5 minutes in simmer. Peel the skin and mash it with red chilli powder and salt. Prepare Sweet Chutney and Green Chutney as per the recipe in the link. Arrange the papdi's in a plate, keep potatoes, onion, tomatoes, raw mango, sprinkle chaat masala and black salt. 2. Add green chutney and then tamarind sweet chutney. Use as per your liking. I prefer to use extra sweet and sour chutney. Squeeze lemon juice around all the papdi's. Add sev on top. Garnish with coriander leaves. Add additional onion, tomatoes, raw mango and sev on the sides before serving!!! Who wants a plate now??? Add curd for dahi papdi chat. Those are my kind of flavors. So good. Equally good is the presentation. I am coming over... feeling really hungry!